By Andrew Liszewski on 06/15/11 • Leave a comment! If you’re one of the many who lament the iPhone’s lack of a memory card slot, thanks to PhotoFast you can lament no more. Their new, uninspiringly named, i-FlashDrive features a standard USB connector on one end, allowing it to function as a regular old flash drive, and an iOS-friendly dock connector on the other, allowing to connect to iPhones, iPads and iPod Touches. When first connected you’ll be prompted to download an accompanying app, which lets you then copy files to and from your iOS device, and even do things like backup your contacts list. It’s certainly an easy way to shuffle files around when you don’t have access to the PC you usually sync with. And it also allows you to easily transfer files directly between two iOS devices, leaving a PC out of the equation completely. 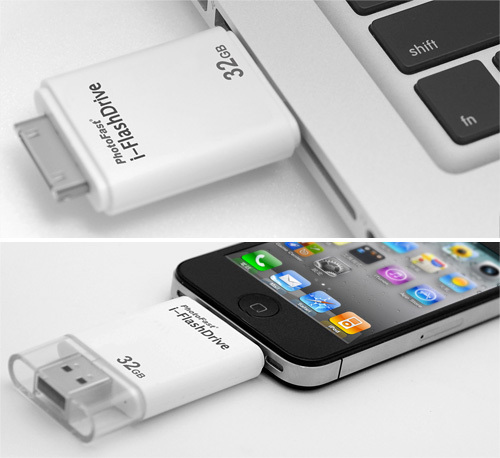 The PhotoFast i-FlashDrive will be available in July in 8, 16 and 32GB capacities ranging in price from ~$99 up to ~$192.